These medium-sized owls grow up to 61 cm long and have a wingspan of up to 1.3 metres long. Females are heavier than males. There are up to 15 sub-species of Ural owls recognised. Ural owls feed on small mammals (especially voles, shrews, mice and rats), frogs, insects and a range of small birds up to the size of pigeons. They store extra food in their nests. They have a wide range of calls, including a very loud territorial call that can be heard 2 kilometres away in the forest. They mate for life and lay 3-4 eggs in a tree hollow or a hole in a cliff or building. The parents are very aggressive while they have chicks and will chase away other birds of prey and even people. 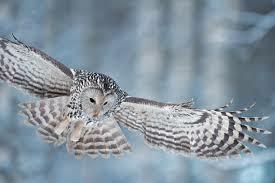 Ural owls live in forests throughout northern Europe, Russia, Siberia, Korea and Japan. They are quite common and are not considered in danger of extinction. Are there any other interesting facts that you would like to share about Ural owls? I liked your picture of the Ural Owl. Everything was so interesting! Ural Owls are fascinating.